CNC collaborates in the organisation of the 4th edition of the CENELEC workshop "ICT on TRAINS", to be held in Brussels on 27-28 September. Focus of this edition is railway digitalisation and data security. All major railways organisations and industries will participate through about 40 presentations. More info in the event Web site. CNC ha realizzato un sistema che consente la realizzazione di trasmissioni video ad alta definizione e audio tramite Internet (in streaming) in modo interattivo, così da coinvolgere gli utenti in diretta. 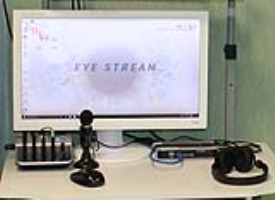 Il sistema consente di assistere ad eventi particolari (interventi chirurgici) come se si fosse presenti nella camera operatoria. Utilizzi previsti comprendono corsi, addestramento, formazione e dimostrazioni. The Shift2Rail Joint Undertaking, a private-public partnership (PPP) which is in charge to manage a wide programme of railway research in Europe, awarded a contract to CNC to provide the Cooperation Tool platform and services to all projects run by their Members.The contract was awarded following an international tender, with deadline 21 October. CNC compare in due articoli comparsi recentemente su primari quotidiani finanziari italiani: Affari & Finanza e Italia Oggi. 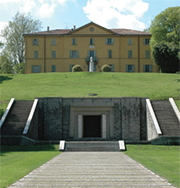 Gli articoli, parte di uno speciale sull'Emilia Romagna, sono focalizzati sulla Fondazione Guglielmo Marconi, luogo di incontro tra imprese e mondo della ricerca. La società CNC viene citata come una delle imprese spin-off, nata nel lontano 1984 e dedicata al settore ICT. The “open web of transportation data” as a shared networked environment for the realization of the Single European Railway Area. 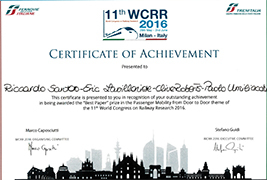 The paper was awarded the "Best Paper" prize in the Passenger Mobility from Door to Door theme. The paper presents the market scenario and technology solutions for door-to-door mobility, which will allow a better travel experience and will make railways more attractive for travellers. A Certificate of Achievement was given to Mr. Riccardo Santoro, main author and official speaker, during the Award Ceremony. Paolo Umiliacchi presented a second paper: Benchmarking performance and energy efficiency trends in railways to depict future scenarios, dealing with energy efficiency and sustainability of transport systems.